If you are an international student interested in nature and science, studying biology or life sciences in the United States might be the path for you. The life sciences comprise of the fields of science that involve living organisms such as microorganisms, plants, animals, and human beings, as well as related considerations such as bioethics. Biology, the study of life, is the most prominent of these sciences, but technological advances in molecular biology and biotechnology have led to a proliferation of specializations and new, often interdisciplinary, fields. An undergraduate degree in biology and life sciences will generally take roughly four years to complete. You will be required to take courses in areas such as biology, chemistry, calculus, physics, biochemistry, and microbiology. Many of the courses you take will require a lab component, so be prepared to put in long, sometimes tedious hours. There are many universities across the United States that have strong biology programs; there is no one “best” college at which to study biology. When choosing a school at which to study biology and life sciences, try to look for schools that fit your needs, budget, and lifestyle. Would you prefer a large university, or a small one? Large schools offer broad course work, a variety of specialized concentrations, and many opportunities for independent research. Small schools offer small class sizes, individualized instruction, and frequent interaction with professors. The faculty is an accurate representation of the diversity of biological disciplines: botanists, evolutionary biologists, zoologists, biochemists, cell biologists, ecologists, physiologists, taxonomists, and so on. Either the biology department should contain faculty members in diverse fields, or be made up of several different departments that complement each other. The courses should be taught by faculty members, not graduate students. Look for schools that have active faculty advisor programs and active career advising/career development programs. The curriculum should include a wide variety of courses that instill a strong background in the natural and social sciences, humanities, and writing, while still allowing you to pursue your individual interests. The school should have well-equipped libraries with internet access to biology journals, as well as easily accessible computer labs for student use. Look for schools with faculty that allow students into their research groups as part-time workers, interns, and research assistants. Find out whether or not opportunities are available for undergraduate students to pursue independent research projects. Find a school that offers the focus and specialty you want to pursue. 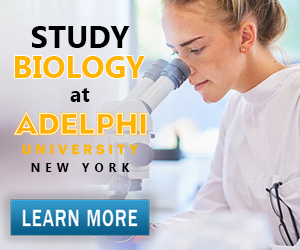 For example, if you’re interested in ocean preservation and marine biology find a school like Adelphi University that’s actively contributing within that area. Led by a faculty member at Adelphi, the Community Oyster Restoration Effort is collecting shells, pairing them with young oysters, and putting them in restoration habitats in an effort to build oyster reefs and reduce ocean acidity. The project enables students to apply their knowledge of marine biology in a real life scenario, and in turn, give back to their community. This is emblematic of the approach Adelphi takes towards education, as they encourage collaborative work that is applicable outside of the classroom. Research biologists use the latest scientific tools and techniques in both laboratory setting and the outdoors to study the natural world and understand how living systems work. Biologists might work to defeat illnesses such as tuberculosis, AIDS, cancer, and heart disease. Others might work to prevent the spread of rare, infectious diseases such as the Ebola virus. You might choose to impart your knowledge to others, whether in a college or university setting, primary or secondary school, or science museum, zoo, aquarium, park, or nature center. A degree in biology will open up innumerable doors to you, if you have the dedication and skill to pursue it. Visit the Study in the USA School search to find schools that offer programs of study in Biology and Life Sciences. Over time we will be updating this section and including more information for those who want to study biology and life sciences in the USA and for other countries, but please feel free to post your thoughts and comments on our Facebook fan page, and also follow us and post questions through Twitter.